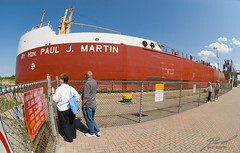 As of a little after midnight I finally have some of the 14 photos from the Welland Canal visit (during the Niagara Falls weekend) posted! I'll get the others up in the morning. To me, the Welland Canal was the highlight of our Niagara Trip. We had some ships to shoot in a new and interesting environment. This was taken at the St. Catharine's Museum at Lock 3, but the lock immediately south are the ones I found most interesting. I'll start getting photos of those up in the morning.